Notwithstanding a considerable body of references in the literature on the buckling response of conical shell structures, it seems imperative to provide further insight on the buckling response of locally imperfect steel cones. 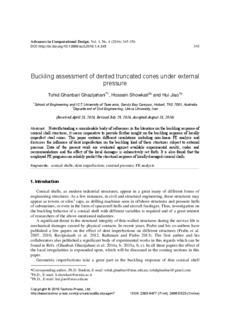 This paper contains different simulations including non-linear FE analysis and discusses the influence of dent imperfection on the buckling load of these structures subject to external pressure. Data of the present work are evaluated against available experimental results, codes and recommendations and the effect of the local damages is exhaustively set forth. It is also found that the employed FE program can reliably predict the structural response of locally damaged conical shells.